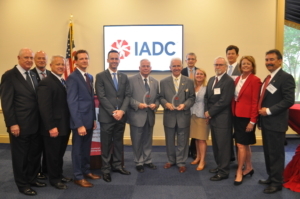 On 10 June IADC honored 30 Members of Congress with the first IADC Legislator Awards, which recognized support for the drilling contractor industry in the 115th Congress. IADC presents Legislator Awards to Representative Gene Green (D-TX) and Representative Jim Costa (D-CA) on 10 June in Washington, D.C. From Left: Bob Warren, IADC; Mike Bowie, Baker Hughes, a GE Company; Scott McKee, Cactus Drilling; Mike Lawson, Rowan Companies; Jason McFarland, IADC; Representative Green; Representative Costa; James Sanislow, Noble Drilling; Liz Craddock, IADC; Steve Brady, Ensco plc; Chris Menefee, Independence Contract Drilling; Terry Bonno, Transocean and Mike Garvin, Patterson-UTI. IADC President Jason McFarland presents Representative Steve Scalise (R-LA) with the 2018 IADC Legislator Award. From Left: Steve Brady, Ensco; Rep. Scalise; Jason McFarland, IADC. 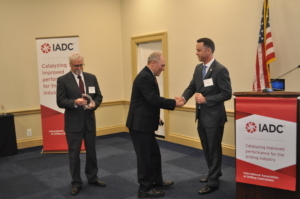 On 11-14 June, IADC hosted a Fly-In in Washington, D.C. for onshore and offshore members. Those who attended participated in 17 meetings and visited with a total of 28 congressional offices over two days. They also had an opportunity to meet with representatives from BSEE and BLM. IADC also hosted an educational ‘Snack and Learn’ event on Capital Hill for Congressional staff, agency staff, trade associations and anyone else who had an interest in learning more about the basics of onshore and offshore oil and natural gas drilling. IADC members in attendance included Christopher Menefee, Independence Contract Drilling Inc.; James Sanislow, Noble Drilling; Michael Lawson, Rowan Companies; Mike Bowie, Baker Hughes, a GE Company; Mike Garvin, Patterson-UTI Drilling Company; Scott McKee, Cactus Drilling; Steve Brady, ENSCO plc; and Terry Bonno, Transocean Ltd. Additionally, Jason McFarland, IADC President, Liz Craddock, Melissa Mejias and Bob Warren, all from IADC, attended the Fly-In events. The Snack and Learn event featured a presentation on Drilling 101, and more than 35 people attended the educational event. The group met with Members of Congress from Oklahoma, Texas, North Dakota, Utah, Louisiana, Arizona, Alabama, New Mexico and Maine. 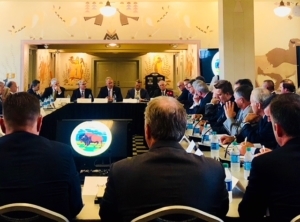 During each meeting, discussion centered on key issues including industry safety, the BSEE Well Control Rule, steel and aluminum tariffs, offshore access, NAFTA, BLM permitting delays, support for state maritime academies and US corporate tax reform. The group also met with BSEE Director Scott Angelle and Bureau of Land Management Deputy Director, New Mexico Sheila Mallory during their time in D.C.
On 28 June, IADC was invited by Department of Interior Secretary Ryan Zinke to participate in a roundtable discussion with other energy executives to discuss his plans to reorganize the Department of Interior and ways in which he can help with speeding up the project permitting process. IADC President Jason McFarland attended the roundtable discussion alongside Andy Hendricks, President and CEO, Patterson-UTI and Paul Mosvold, President/COO, Scandrill, Inc.
IADC members and staff meet with U.S. 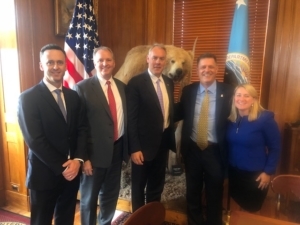 Interior Secretary Ryan Zinke in Washington, D.C. From Left: Jason McFarland, IADC; Andy Hendricks, Patterson-UTI; Secretary Zinke; Paul Mosvold, Scandrill, Inc. and Liz Craddock, IADC. Presidential Executive Order on Ocean Policy Aims to Advance the Economic, Security and Environmental Interests of the U.S.
On 19 June, the U.S. President issued an Executive Order (EO) regarding the ocean policy to advance the economic, security and environmental interests of the U.S. The EO supports and encourages the government to work to facilitate the economic growth of coastal communities and promote ocean industries, advance ocean science and technology, enhance America’s energy security and ensure that Federal regulations and management decisions do not prevent productive and sustainable use of ocean, costal and Great Lakes water. To read the Executive Order in Full, visit the White House website. The House also passed the NDAA and a slew of other bills intended to combat the opioid crisis. This month, the chamber tried to pass two different immigration bills, but both failed to gain enough support for passage in the U.S. House. Earlier in the month, they passed the Water Resources Development Act, or WRDA. This month, the Senate passed the National Defense Reauthorization (NDAA), an appropriations minibus which contains three Appropriations bills for Military Affairs, Energy and Water and Legislative Branch. They have also begun consideration of the Farm Bill, which reauthorizes the nation’s farm support programs. The White House spent the month focusing on immigration, specifically it’s family separation policy at the border between the U.S. and Mexico. In addition, tariff and NAFTA negotiations are ongoing. The Supreme Court upheld the President’s travel ban, and the President will have the opportunity to select another Supreme Court pick with the retirement announcement of Justice Kennedy. The IADC Brazil Chapter, represented by its Executive Secretary, Dr Leandro Luzone, recently worked with several industry groups to help prevent the advance of a bill that would have changed Repetro in the state of Rio de Janeiro. Repetro is a special customs regime that allows the import of specific equipment to be used directly in the oil and gas research and mining activities without incurring federal taxes. This enables the temporary entry into the country of high-value equipment for use in oil and gas E&P. The bill, which had been advanced by the Rio de Janeiro Parliament, intended to limit the tax limit to only the exploration phase. The justification was that the state of Rio de Janeiro could not lose out tax revenues due to the country’s ongoing financial crisis. Under the pretext of increasing revenues in the short term, the proposed bill would have led to job losses in the state in the medium and long term, as companies that are currently working in Rio de Janeiro may opt to work in other tax-exempt states. 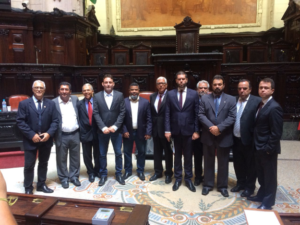 Dr Leandro Luzone, IADC Brazil Chapter Executive Secretary, met with multiple state legislators during the chapter’s efforts to prevent changes to the Repetro tax regime this year. Pictured include Macaé city councilors Maxwell Vaz (far left), Marvel Maillet (fourth from left) and Val Barbeiro (fifth from left), as well as Jose Walmir with SPE (fourth from right); Guilherme Abreu, Macaé’s Conventions and Visitors Bureau President (third from right); and Evandro Cunha, Firjan’s Coordinator in Macaé (second from right). The Machinery Directive was adopted in 2006, and became applicable in 2009, and is the core European legislation regulating products of the mechanical engineering industries. It’s objective is to ensure a high level of safety and protection for machinery users and other exposed persons and to secure the free movement of machinery in the internal market. In 2015, after six years of implementation, it was necessary to assess if the Directive had achieved its objectives. The purpose of the evaluation was to analyze the performance of the Machinery Directive, assesses the extent to which it is fit for purpose and whether it continues to deliver effectively, efficiently and at minimum cost the intended benefits for consumers and businesses. 99% of the respondents to the evaluation rated the Machinery Directive as important to the objective of ensuring a high level of health and safety for users of machinery. However, while a majority of stakeholders view the directive as providing a suitable framework at present, doubts have been raised regarding the directive’s ability to remain fit for purpose in the face of emerging Artificial Intelligence and the Internet of Things developments. To access the full report, please visit the European Commission website. On 21 June, the U.S. Bureau of Safety and Environmental Enforcement (BSEE) released a report from the National Academies of Science entitled, “High-Performance Bolting Technology for Offshore Oil and Natural Gas Operations”. The objective of the BSEE-sponsored study was to determine the optimal material properties and coating requirements associated with fasteners used in critical safety components and equipment in offshore oil and natural gas subsea applications. A copy of the report can be purchased via the National Academies of Sciences, Engineering and Medicine website. In coordination with the ABS Group, the U.S. Coast Guard provided Area Maritime Security Committee members “Maritime Transportation System Cyber Awareness” training via webinar. In consideration of those who were not able to participate in the webinar sessions, the Coast guard has made available a recording of the training online. The training was developed to provide basic cyber awareness with a focus on maritime facility and vessel operations. The awareness training is intended to provide personnel at all levels of an organization with a basic understanding of cyber terms and systems that may be encountered throughout the Marine Transportation System. To access the online training, please visit the Coast Guard Maritime Commons blog. On 12 June, the U.S. Bureau of Land Management (BLM) issued an Instruction Memorandum on Directional Drilling into Federal Mineral Estate from Well Pads on Non-Federal Locations. The purpose of the Instruction Memorandum (IM) it to establish polices and procedures for processing Federal Applications for Permit to Drill (APD) proposing to drill into and produce leased Federal minerals from well pads on entirely non-Federal locations. The policies and procedures apply to the processing of APD’s for wellbores that produce Federal minerals from well pads that are located on entirely non-Federal land. The BLM commonly refers to such well as “Fee/Fee/Fed”. The IM begins with guidance for complying with the National Environmental Policy Act (NEPA), the Endangered Species Act and the National Historic Preservation Act when processing APDs in three specific Fee/Fee/Fed situations. Following the discussion of these 3 situations, the IM provides additional general guidance for processing Fee/Fee/Fed APDs. To access the entire Instructional Memorandum, please visit the U.S. BLM website. On 8 June, the UK Maritime and Coastguard Agency released its final version of the UK National Standard for Marine Oil Spill Response Organisations. Introduced after a consultation with industry on the creation of a UK national standard for Oil Spill Response Organisations between January and March 2018, the standard contains up-to-date best practice guidance for organizations delivering Tier 2 spill response services in the UK. Applicability of this standard extends to all offshore installations on the UK Continental Shelf. 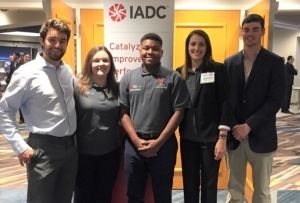 Five students from the ULL Student Chapter were also invited to attend the 2018 SPE/ IADC Managed Pressure Drilling & Underbalanced Operations Conference on 17 and 18 April in New Orleans. Pictured from Left: Damon Emmitt, Allison Morency, Garrett Mallires, Kassie Comeaux and Colby Williford. 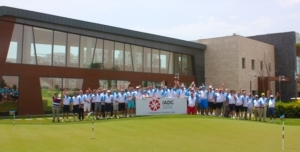 The IADC Caspian Chapter hosted a golf tournament, the Chairman’s Trophy, on 26 May in Baku at the Dreamland Golf Club. More than 50 chapter members participated in the inaugural event. IADC is moving! The IADC Houston office will open the doors to its new headquarters on 2 July, 2018. The Association looks forward to welcoming members to the new corporate headquarters beginning the week of July 2. The agenda featured five up-and-coming drilling technologists to present their perspectives on technology, decision making and more. In lieu of individual Q&A, the speakers participated in a panel following all presentations. In addition, spokespersons for DEC joint industry will provided updates on their work, and a proposal was made for a new JIP. DEC Advisory Board Member Robin Macmillan of National Oilwell Varco opened the meeting, welcomed the attendees and reviewed the agenda. The HARC Environmentally Friendly Drilling Systems Program (EFD) seeks industry support to develop a predictive model using advanced instrumentation and data science. The model will support planning and optimization by addressing uncertainties of fuel consumption, engine performance, emissions, and environmental factors. Following the presentations and discussion, Mr Macmillan adjourned the meeting. Lunch was sponsored by NOV. The IADC Advanced Rig Technology Committee will host the next ART Spark Tank, scheduled for 0900-1130 on Thursday, 16 August, at IADC headquarters in Houston, Texas. Note the change in date for the Spark Tank – 16 August is the new date, replacing 30 August, the old date! The IADC ART Spark Tank is a strong opportunity to provide technology entrepreneurs a new opportunity to pitch their products and ideas to a panel of drilling contractors and operators (“Sharks”). The Spark Tank provides insights (“Sparks”) to technology developers into what matters to those they are innovating for. There is sometimes a vast disconnect between a good idea and a great product, and this series will attempt to close that gap in a good-natured, productive manner. For IADC members with operations in Colorado, the Colorado Oil & Gas Conservation Commission (COGCC) conducts a monthly “Industry Operations Meeting” with industry’s technical, operations and regulatory staff to discuss issues or concerns regarding compliance expectations. The purpose of the meetings is to facilitate compliance by enhancing communication and resolving issues quickly. All meetings are held from 9 to 10:30 a.m. at COGCC’s Denver office unless otherwise noted. The next meeting is scheduled for July 17. More information can be obtained at the COGCC website. Preliminary results of a survey on usage of the IADC Daily Drilling Report (DDR / “Tour Sheet”) provided valuable feedback that will help guide the process of updating the report for maximum benefit for the industry. The IADC Drilling Controls Systems Subcommittee, which sponsored the survey and the draft rig states, is advancing the IADC DDR Plus project, which seeks to enhance the DDR. The DCS is a subcommittee of the IADC Advanced Rig Technology Conference. More than half the recipients indicated that they used the DDR to receive data; for end of well reporting; and performance analysis. Other common responses were to provide data; verify/confirm payments; satisfy internal policy; invoice providers; and reporting to government. 61% of respondents reported using the electronic version of the IADC DDR, while 23% use the hard copy; and 13% use both. 79% of respondents use the DDR to track activities, indicating that the form connects to performance. The complete survey results are available as a PDF on the IADC Website. Small surges of pressure that oscillate within the line or vessel; cyclic surges are associated with line or vessel equipment, such as reciprocating pumps/compressors and pressure reducing valves.